Like many teenage girls, I tried out vegetarianism in high school for about three months. I lost weight, my skin turned an odd(er) shade of white, and all I could think about was turkey croissants and sausage. Although my vegetarian experiment didn’t last long, I still try to eat vegetarian at least once a week. It’s healthy, of course, but also cheap. Tonight’s dinner, made with all organic ingredients, served two adults and one toddler and cost about $6, about the price of a fast‐food value meal. Carefully rinse the tofu, then cover with cold water in a medium saucepan. Bring the water to a simmer over medium‐high heat, then keep warm, covered, over very low heat. Meanwhile, mince and mash the garlic to a paste with a pinch of salt. Stir together the garlic paste with all remaining ingredients except the tofu and hot pepper flakes. Just before serving, carefully lift the tofu from the saucepan with a large spatula and drain it on paper towels. Gently pat dry, then cut the tofu into 4 to 5 slices. 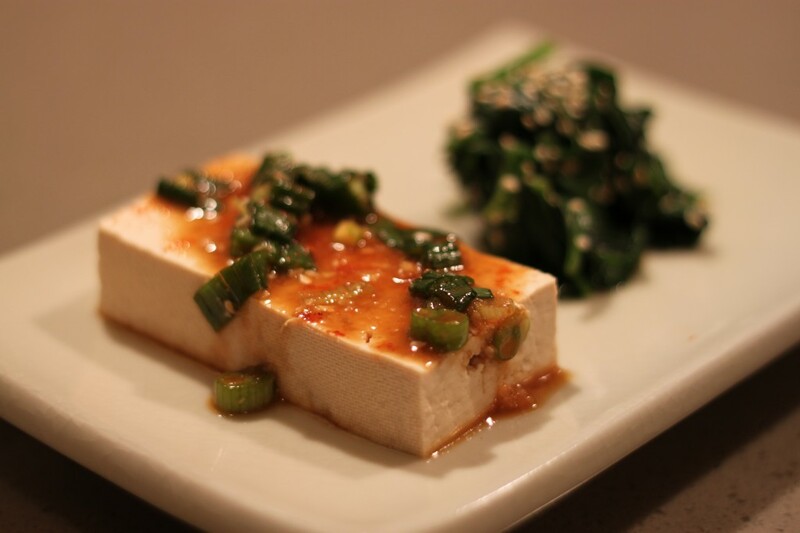 Spoon some sauce over each tofu piece, sprinkle with pepper flakes to taste, and serve warm. Serve the remaining sauce on the side with rice. Wash the spinach and drain, but do not dry thoroughly. Place the spinach in a large saucepan and cover with a tight‐fitting lid. Cook the spinach over a medium heat until wilted, about 5 minutes. There should be enough water on the spinach to steam it. Toss the cooked spinach with soy sauce and garnish with sesame seeds.